ONLINE REGISTRATION IS CLOSED. Race day registrations WILL be available at this event. Be sure to read the "Race Day Details" section below for more information. You can also read the entrant email online here. The Sharkfest Series has gone INTERNATIONAL! This not-to-be-missed tropical adventure will take place in beautiful Troncones, Gro., Mexico. The event will be an untimed, non-competitive affair where everyone swims together as a group. 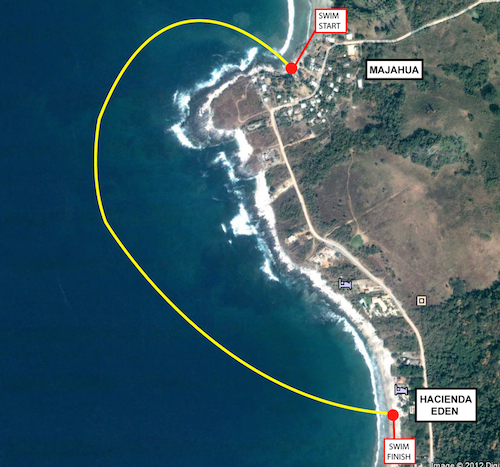 The swim will start in the sleepy village of Majahua, go out around Point Majahua and then finish in front of Hacienda Eden in Manzanillo Bay. Who can pass up an opportunity to swim in Paradise and finish at Eden? We are asking for a small donation from each swimmer to cover the cost of t-shirts, power boat captain fees, etc. READ ALL THE RACE DAY DETAILS ONLINE HERE. INCENTIVES: T-Shirts for all participants. RACE DAY DETAILS: An email with all the race day details will be sent to all registered participants 1-2 weeks prior to event day. All race day details and updates are also posted below in the "Race Day Details" section. CANCELLATIONS: Registrations are non-refundable. If you can no longer participate in this event, you may receive a rollover credit (minus a $20 processing fee) toward a future event as long as you let us know by December 9 2015. After that date, a doctor's note is required to receive a credit. Any shoes or light clothing will be transported from the swim start back to the finish at Hacienda Eden. Shirts will be mailed to all participants in February. Follow Highway 200-North from Zihuatanejo. You will go out of town and up a big hill, at the top of the hill is an exit for Lazaro Cardenas to the right, take it! After about 24 Kms or 15 miles you will pass the village of Buena Vista (you have already passed Salitrera and Pantla), continue on for about 6 kilometers (4 miles). After a church on your left, and some bee hives on your right, begin looking for the TRONCONES sign. Turn left and continue on a small two lane paved road road for 3 kilometers (2 miles) to the village proper. Turn right at the beach and pass over a bridge, follow the road for 4 kilometers (3 miles) (you will pass, Casa Ki, La Casa de La Tortuga, La Casa Delphin Sonriente and Regalo del Mar and many many others), after a bit you will come to a fork in the road; stay on the right, and you will find us after a quarter of a mile more on the left, we have a very long green wall, you can’t miss it. It should take you about 50 minutes to arrive from the airport.